This entry was posted on 18th March 2019 by Life Changing Challenges. We awoke early at the Shira camp on day 3 to frozen tents and although the hot water to wash was welcome – what we really needed was that water to be prioritised to provide a caffeine kick up the backside. A group discussion with the guides had that request approved for future mornings as we voted for the wet wipe wash! Keeping clean in the field is always an art and in the dusty environment of Kilimanjaro, a near impossible one at that. 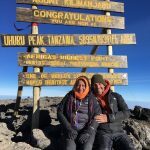 Prior to arriving in Tanzania I had no trepidation about the group we would be climbing with, I really had no idea on who they were and in all honesty was more concerned with my own performance. At 12 strong we were told we were a rather small group but my what a group. I could wax lyrical about my climbing partners for hours, a variety of backgrounds and ages, of abilities and experience it was wonderful to be with so many people with such diverse reasons for being here. With the exception of the summit day, day 3 would be the longest in distance and time on our feet. Kicking off from Shira camp at 3,850m we would climb to Lava tower for lunch (4,590m) to aid with our acclimatisation before dropping back down to the Barranco camp at 3,950m. The day would see us cover around 13km with an overall height gain of only 100m by the end. We would be on our feet and moving for around 8 hours. The effects of altitude were already having somewhat of an effect on the majority of the group. Complaints of severe headaches were common as were stomach cramps, dizziness and general unease. The guides were quickly turning into mobile medical dispensaries as they dished out various pills and tablets like smarties. Their knowledge on the effects of each medication and how they reacted with others was impressive to say the least. The terrain was hard work, resembling a dusty moonscape with large boulders it was stunning in its simplicity but with the sun burning down on us at that altitude our factor 30 sun cream was as effective as water. As we inched closer and closer to Lava tower the altitude started to have severe effects on the group, progress slowed to a near crawl. You could see the pain in the faces of those that were struggling but they all gainfully continued until we collapsed gratefully outside the lunch tent at the highest altitude we had yet reached. A short lunch stop, a restock of water and the guides were keen for us to continue with the second half of the day. We had our first descent to contend with here which was hard on the thighs but we continued. The struggles of some of the group started to split us up as we travelled at different speeds, the guides allowed us to continue this way dividing themselves up accordingly but for the first time I feared that not all of us would make it up. Kertrina was struggling with a bad headache and felt incredibly sick and trying to keep the much needed food down was looking like a challenge in itself. 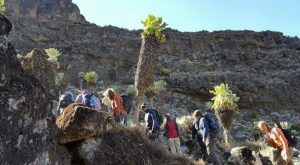 As we descended though, the effects dissipated in some and after 8 hours (and stunning scenery) we arrived at the impressive Barranco camp that sit’s just underneath the imposing Barranco wall – tomorrow’s challenge. Seeing the wall, and the tiny track that wound its way up the wall Kertrina looked nervous as hell. Being scared of heights, this would be her biggest issue and since returning she has said on a number of occasions that if she knew the wall looked like that – she wouldn’t have come at all! During the evening brief we were informed that the poles would not be needed for the wall and that this would be a technical climb – I was buzzing! There were 3 of the group I was concerned about that night, Kertrina being one of them but the next morning they were all itching to get going with Lazarus like powers of recovery it was remarkable and lifted the entire group. We set off for the wall. At 300m in height we had around 2 hours of climbing followed by a short 2 hours onto the camp at Karanga at an elevation of around 4,200m. Taking my position at the back of the group, Innocent led us up the wall. Progress was slow to start with and word was passed down to me that Kertrina was struggling, making my way to the front I could see that she was in tears and not a little distressed with the climb so with one of the guides in front and me behind we coaxed, cajoled and at times pushed and pulled her up until after just over 2 hours we hit the summit. Catching up with the group it was clear that not only Kertrina found the height an issue, her phobia was a real problem though and she overcame it – I’m incredibly proud of her determination and of those that also found the drop into the valley more than a little daunting. Gathering ourselves after a group photo we headed off on a rather uneventful trek to the Karanga camp. We were losing track of days when we awoke at Karanga and desperately trying to think of how long we had to go before we went for the summit. Throughout our previous day we could see Uhuru and even on this morning it looked like a long way off but we knew that in less than 24 hours we would make our summit push. 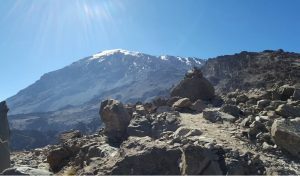 Today’s trek would take us from Karanga at 4,200m up to the Barafu encampment at 4,600m – our final camp before the summit. The trek was short and we were promised an afternoon of relative relaxation. Sickness, headaches and dizziness had returned to some with a vengeance but seeing how they had conquered the wall I was feeling less and less worried that they wouldn’t make the summit. 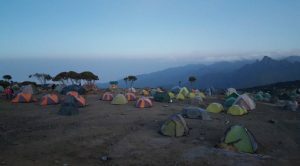 After 4 hours we reached camp and could see the track along the ridgeline that would take us all the way to the summit. After a brief lunch the topic of conversation turned to equipment and clothing for the summit – the guides did their best to provide guidance and with a kick off time set for 23h00 that night we knew the temperatures would be sub-zero. 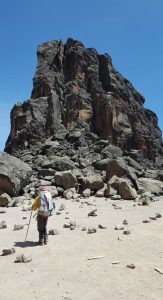 It would take us around 7 hours to make the 1,145m climb to Stella Point with another hour for the trek to Uhuru peak itself – it was going to be a tough day. I opted for my trousers, gaiters and waterproof over trousers whilst opting for 5 top layers, hat and gloves. Bruce the senior guide was worried that this might not be enough so I quickly stuffed a couple of extra layers in my daysack content that the warmth of the climb would be enough.